A young boy standing next to a Thanksgiving feast on a table. Thanksgiving is a holiday that brings friends and family together to share a good meal, conversation and laughter. But Thanksgiving also comes with several health hazards, including an increased chance of fires, food poisoning and choking. The U.S. Fire Administration reports that on Thanksgiving Day, the average number of cooking fires doubles. In addition to installing a fire detector in the kitchen, don't leave the kitchen while frying and grilling. Use a timer and do kitchen checks when simmering, baking, broiling and roasting. If you are deep-frying a turkey, keep the fryer outside, away from walls, fences and other structures. Also keep the fryer away from moisture to avoid burns from steam and spattering oil. Keep pot holders and food wrappers 3 feet away from the stove or other hot surfaces. Kids should stay 3 feet away, too. Make sure the handles of pots and pans are facing inward. Avoid loose clothes, especially those with long sleeves, while cooking. Make sure all candles are put out after the guests leave. Eating undercooked turkey is another Thanksgiving health problem. If a turkey is thawed at a temperature above 40 degrees Fahrenheit, salmonella or other bacteria that cause food poisoning can grow. Safely cooking a turkey starts with correct defrosting. There are three methods for safe defrosting. The turkey can be thawed in the refrigerator -- one day for every 5 pounds of the bird. The turkey can be submerged in water if it is in leak-proof packaging -- 30 minutes for every pound. The water should be changed every half hour. It's also safe to defrost a turkey in a microwave. Remove any packaging and follow the manufacturer's instructions. Cook the turkey immediately after thawing. Don't slow cook or partially cook the turkey, and check the temperature with a meat thermometer to determine if it's done. Even if the turkey came with a pop-up thermometer, it's necessary to check the innermost part of the thigh and wing, and the thickest part of the breast. The turkey and stuffing need to be at least 165 degrees Fahrenheit. The most common cause of choking is talking while eating. If a person is unable to cough, breathe or speak, the first thing to do is call 911. Next, the Red Cross recommends a technique called FIVE-and-FIVE for choking victims. The first step is giving the choking victim five sharp blows on the back, using the heel of the hand. If the obstruction is not dislodged by this move, the next step is to give the victim five quick, upward abdominal thrusts. Some people run from the table when they start choking. It's important to stay with other people so they can give assistance. If the victim is alone, he can give himself the five abdominal thrusts using his hand or by pressing his abdomen firmly against the back of a chair. 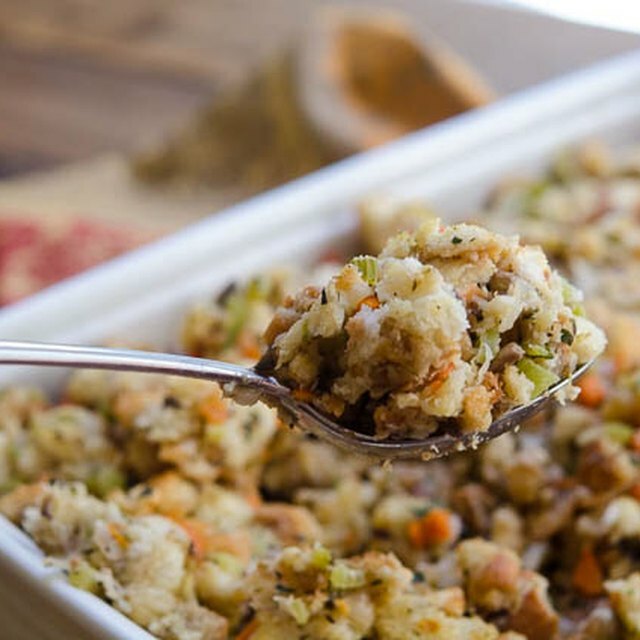 Eating Thanksgiving leftovers that have been improperly stored can lead to food poisoning. Leftovers need to be put away within two hours after serving the food -- this includes pumpkin pie. They go in the refrigerator if they are going to be eaten within three days; otherwise, they go in the freezer. Food should be stored in shallow containers. Meat should be removed from the bone before being put away. Reheated leftovers should be cooked to 165 degrees Fahrenheit. Gravy should be brought to a vigorous boil. Thanksgiving brings health hazards to dogs and other pets as well as humans. Don't give turkey bones to pets. Turkey bones and other bird bones are hollow, which makes them likely to splinter. This can cause tears in an animal's esophagus, stomach or intestines. Be careful about leaving chocolate candies out (or kids dropping candy on the floor). Chocolate can cause illness and even death when dogs ingest it. In addition, dogs shouldn't be fed grapes, raisins, onions, alcohol or anything with caffeine. It's also important to keep the string used to tie the turkey and other food wrappings out of reach of pets. Dogs tend to be excited when there are a lot of people in the house. When they are excited, they often eat too quickly, and this can lead to bloating -- a very dangerous condition. Feed your dog before the guests arrive and don't let them be too active before or after eating. Melinda Dean is the author of more than fifty books (under various pseudonyms) for kids and young adults. Her publishers include Simon Pulse, Simon Spotlight Entertainment, Grosset & Dunlap, Aladdin, Razorbill and Archway. Before becoming a writer, Dean spent ten years as an editor. How Important Is Breakfast to Middle School-Aged Students?